If you are wondering what kinds of books I review and events I host, this little section is the place to look. Books I love to read: Children's, Young Adult, Paranormal and Fantasy books. Books I like to read: General Fiction, Romances, Religious Fiction, Mysteries and Biographies. So those are the genres of books I will generally review. If you send me a book outside of those areas, I'll consider it, but it may not fit my tastes. Reviews will take about 2 months to post; I try to post them around the time the book is released. On giveaways: Sending me a signed book to give away on the site is a great way to get your book noticed. I do a "mystery book" giveaway about every 2 weeks, where I read the book and twitter about it without revealing its title, then reveal what I've been reading and give it away. The whole event takes a couple weeks, and I feature the giveaway book on my blog for most of that time. The story of two children zooming around on a rocketship is written with dream like quality. With artwork that is fun, whimsical and smart, this book is a great before bedtime tale. Author Carole P. Roman has a knack for coming up with cute and informative children's books. Rocket - Bye is no different, as it goes through the planets names and a view of the stars. You and any child will be filled with calm wonder. I had only one issue with Rocket-bye is that in the part where the children learn the names of the planets, Pluto is the last named. To my knowledge Pluto is no longer cataloged as a planet. Or I could be wrong and it may have been changed it back. 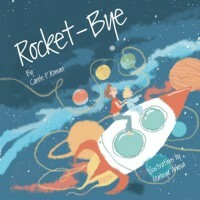 Rocket - Bye is for both boys and girls. It is not too challenging to read and is a joy to view as is all of Carole P. Roman’s books.